Okay, I know, I grew up in Adelaide so why am I writing about this place as if I were a tourist. Well, having lived in Melbourne for two and a half years, and despite knowing quite a few people back here in Adelaide, this last visit has felt as if I were a tourist, and while there is a lot more to see and do beyond what I have written here, I just felt like sharing some of the things that I have seen and discovered as I spent my time in the city. I have already written posts on the State Library of South Australia and the Art Gallery so I won't go over old ground, however there are still quite a few other places to explore beyond these two institutions (such as the Zoo, Tandanya, or Central Markets) however I will be restricting myself to only the places that I have wondered past (though not necessarily going inside, though I am sure I can do so on later visits). So, I will begin my journey where I begin most journeys in Adelaide, and that is the Railway Station. This is the terminus for all of the metropolitan trains in Adelaide (and there are four lines - Seaford, Belair, Outer Harbour, and Gawler Central) with two of those lines having branch lines (the Tonsley Line from the Seaford Line, and the Grange Line from the Outer Harbour Line). With the exception of one of the lines (Seaford) all of the Adelaide trains are diesel powered. Upon returning to Adelaide the railway station feels more like a terminus for country trains as opposed to a metropolitan railway station because I have become so used to trains simply passing through the central station. The station itself was opened in 1922 after a competition was held to produce the designs for a large station to handle the growing capacity of the rail network, and has now become listed on the heritage register. Being the terminus the Adelaide Railway Station is pretty much the busiest station in Adelaide. The station itself has undergone numerous transformations - I still remember when we would buy our paper tickets at the booths on North Terrace, and if you wonder into the bar in the Casino you can still see the old ticket windows (though they are currently revamping the bar so I am unsure whether they will remain). They have also recently added an escalator to allow people to ascend from the concourse to North Terrace without having to either climb the ramp, or the stairs (though there is an arcade that goes under North Terrace and out the otherside. 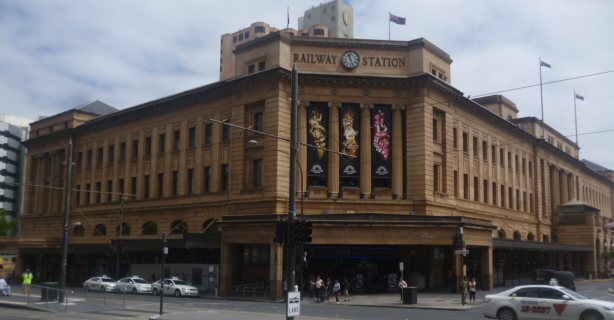 The other thing about the Railway Station is that it is where the Adelaide Casino is located. Okay, Casino's aren't really my favourite place to while away my time simply because I have much more sophisticated ways of losing money. That aside, I also tend to find them quite boring, and even if the operators use euphemisms like 'entertainment complex' in reality it is still a casino. However, while the Casino is dull, the location isn't because it takes up a lot of the old rooms in the building. While many of rooms have been done over, the grand hall is still in its original condition (ignoring the gambling tables and the bar at the back). I even remember watching a world cup soccer match here. Anyway, ignoring the gambling aspect of the casino (which is probably hard to do, but try anyway) the complex does have a number of restaurants ranging from classy ones with reasonably high price tags, to the rather cheap one on the second floor were you can get a decent feed for under $15.00. I also liked coming here because the drinks were cheap and there were little places where I could sit and hide and read a book. This was the location of the original parliament of the South Australian colony until they built the new faux neo-classical building next door (which originally was supposed to have a dome but they ran out of money). Around 1980 they opened the Constitutional Museum which chronicled the history of the colony and its governance. I remember coming here on school excursions as a kid and we loved it. The museum was fully interactive which included a small room fitted out like a cabin from the ship that brought the first colonists - the HMS Buffalo. There was also a recreation of the original legislative assembly chamber, where unlike the modern chamber, which is a semi-circle where the government an opposition face each other off (and the cross benchers sitting on the curve), it was constructed more like a modern lecture theatre where the representatives all sat facing the speaker (there were no political parties back then, just loose alliances). However, in 1995 the politicians wanted more space for offices so the constitutional museum was closed and the building reverting back to parliament. Located behind the railway station and parliament house is the Festival Centre, a purpose built arts precinct originally commissioned by Premier Steele Hall to provide venues for the Adelaide Festival of Arts. Ironically it was completed one year prior to the Sydney Opera House, and also within budget, though this was only the main building facing King William street (the rest of the centre, including the plaza, was completed in 1977). There are five venues at the centre: the Festival Theatre, the Space Theatre, the Duncan Playhouse, the Artspace Theatre, and the amphitheatre - an outdoor venue that overlooks Elder Park and the River Torrens. Pretty much all of the major productions that come to Adelaide are performed in the Festival Theatre (which I believe is the largest venue in the city) including productions such as Wicked, Les Miserables, and Cats (as well as many, many others - including Thriller - have appeared here). The State Theatre Company and the State Opera Company also hold performances here. I myself have seen a few, though most of them have been plays which are generally in either the Space Theatre or the Duncan Playhouse (the last one being The Importance of Being Ernest). To the north of the theatre is basically a large plaza with some really strange sculptures, which I must admit that I still have no understanding what they mean, though apparently it was designed by a controversial German artist Otto Hajek. While the sculptures themselves are interesting, nothing ever seems to happen here and the only reason people come here is to cross from the railway station to King William Street. When they removed the sections over Festival Drive, the need for people to come here diminished even further. North Terrace is considered to be Adelaide's cultural strip with numerous heritage buildings located along here, as well as the Art Gallery, the Museum, and the State Library. Between King William St and Kintore Avenue is Government House (though unlike the Governor's residences in other states, the South Australian residence is generally not open for tours, though if you are really lucky you might actually land up here, though you probably need to be pretty special for that to happen). I remember as a kid I always wanted to see over the tall brick fence that separate us plebs from the governor and his staff, and even now, despite being a little over 6' tall, I still have difficulty looking over the fence (though I can always take photos using my mobile phone). There has always been a wide promenade between the the northern edge of government house and the road, though years ago this used to be a haunt for winos. I even remember when my friends would talk to them (we were all young at the time and we would talk to nnybody) and in many cases they were all pretty harmless. They generally sat of the seats with their cask wine talking among themselves. However those seats have long since gone and the place has been cleaned up significantly. On the south side of North Terrace is the Myer Centre, which is basically a shopping centre that is dominated by Myer. However the frontage still has the buildings that were there previously. When the Myer Centre was being built there was a huge outrage that it was suggested that these buildings would be completely removed, so after a lot of public pressure, it was agreed that the frontage would remain. At the corner of King William Street and North Terrace is the statue of a soldier riding a horse with one leg off the ground. I once read an article that suggested that the number of legs that the horse has off the ground is an indication of how the rider died (though as it turns out, this is a myth). Anyway, after reading this I decided to go an check this statue out to find how true this was, however when I got here I discovered that it had nothing to do with the death of a famous general, but rather was the war memorial for those who fought and died in the Boar War. Okay, this may not be as impressive as some of the other war memorials in Australia, but I have always particularly liked this one, especially with the carving of the angel holding a sword and the farmers looking on in fear. During the day the building is open and you can walk in here and look at all the names of those who had died in war. When I wondered in there I noticed that all of the plaques were relating to specific battles in World War One (Amiens, Paschendale, Gallipolli) and was wondering where the memorial for those who had died in World War II was located. It turns out that it is located in the gardens outside opposite this structure. It also surprised me that many more South Australians died in World War I than in World War II (it almost looked like 1 soldiered died in World War II for every 4 soldiers who died in World War I). There are also some memorials for the wars that had occurred after World War II. As mentioned, there are a number of culturally significant buildings located on North Terrace, including the State Library of South Australia, the South Australian Museum, and the Art Gallery of South Australia. I have already written posts on the library and the art gallery, so I will not repeat myself here, however I will make a few brief comments on the museum (despite not visiting it, and not having done so for quite a while - in fact the only times I ever came here was when they had exhibitions). The funny thing about these state museums is that the collections always seem to be a mixed bag. I was at one stage thinking of calling this place the museum of natural history because I can remember a large display of stuffed animals, but there is more to the museum than just that display. Okay, for most of my childhood I remember to two huge whale skeletons that were in the windows (though since they revamped the foyer they are no longer visible from the outside) and I always thought they were dinosaurs (though my Dad would repeatedly correct me). There is also a small Egyptology room in the museum (which I believe includes a mummy), as well as collections from indigenous cultures around the region. The museum also has a mineralogy and a astronomy display as well as a collection relating to the history of science. This place was my alma mater (I believe that is the term that you use to describe the place where you studied for your tertiary degree) and I do have quite a lot of fond memories of the seven years I spent here. However the section facing North Terrace contains some of the older buildings of the university including the Mitchell Building, which houses the Classics Museum; the Elder Conservatorium, where the school of music is located, and also hosts concerts; and the Bonython Hall, which is a large neo-classical building where the graduation ceremonies are held (as well as hosting large lectures). I still remember going to classes in the Mitchell building and always being held in awe at the foyer. However due to administrative needs, the classics department was eventually kicked out of some of the rooms and we were forced to relocate to some of the less awe inspiring buildings. Located one street south of North Terrace is Rundle Mall, which is basically Adelaide's shopping precinct. Unlike other cities, all of the shops are located in this small section of the CBD (though there are others located elsewhere, namely because leasing retail space here is not cheap). Rundle Mall is where you will also locate numerous buskers as well as a few stalls and outdoor restaurants. Recently, in the last couple of years, the council has enacted a smoking ban all along the mall, which has certainly changed it somewhat. However at night this place completely closes down, which has caused a few problems since to the east, along Rundle Street, there are a lot of cafes and trendy pubs, while to the west, along Hindley Street, you have the more downmarket entertainment precinct (though that is also slowly changing). By far the most prominent structure in Rundle Mall are two large shiny balls, one sitting on top of the other. This structure is considered by the locals to be the heart of Adelaide, and when they removed them temporarily to give them a really good spit and polish, there was a huge outcry. In fact, you are not a true Adelaidean unless you have met friends 'at the balls'. A bit further along Rundle Mall is a more recent addition to the shopping strip, namely four brass pigs going by the names Truffles, Augusta, Oliver, and Horatio (apparently there was a competition to name these statues). From what I have been told, these pigs have to put up with quite a lot, the least being children running up to them and giving them a pat. There are a few other sculptures along the mall, as well as Adelaide Arcade, a very old arcade on two levels. While I am not a huge shopper myself (I don't see the need to spend money on things that I really have no use for) it is always interesting wondering around here, especially when some of the characters that are familiar to all residents of the city make themselves known (such as the Beep Beep Man, or the guy in the leotards). Of course, it has been two and a half years since I have lived here, and even then I must admit that I have not seen those characters for quite a long time, and I am not even sure if that guy that would stand at the entrance to the mall screaming out incomprehensible rubbish is still there. In the end I guess that is one of the major differences between Adelaide and Melbourne - while both have museums, art galleries, and theatres, in Melbourne if one sees somebody who is slightly out of the ordinary (such as the guy in the singlet who dances on Swanston street) people just look at them, shrug their shoulders, and say 'yep, that's Melbourne, where as in Adelaide, as long as they are harmless, they become celebrates. This post has also been posted on my travel blog. If you wish to use this work commercially please feel free to contact me. All images on this post are © and/or ™ their relevant owners. If you are the owner of any of the images used on this website and wish them to be removed then please contact me.